Sports video games are in a tough spot, in my opinion. They have benefited greatly from hardware advancement over the decades, and are able to offer much more accurate simulations of their real-life counterparts with things like incredible graphics and advanced physics and AI. But along with that sports games have undoubtedly become more complex, and are often difficult to approach with their many button inputs and moves. I also feel that sometimes sports games fail to capture the essence of the sport they’re trying to mimic, as even though the action on screen is faithful the their real-life counterparts it often doesn’t “feel" like you’re actually playing that sport. More like just inputting your button combinations and watching what unfolds. That’s why I’ve always kind of preferred arcade takes on sports. They may not be realistic portrayals, but they’re more fun and usually more welcoming. So when I saw the videos for Tennis Champs Returns (Free) a couple of weeks ago, I thought “Awesome! A super simplistic old-school style tennis game!" It was in fact a remake of a 20-year old Amiga game, so how complex could it really be? Well, what I got instead was a deceptively deep game that somehow is still totally approachable, and does such an excellent job ramping things up you can actually feel yourself growing in skill as the game moves along. It may look simple on the surface, but this is a game filled with layers of nuanced game mechanics and fantastic AI. It comes together to create not just one of the best tennis games, but one of the best overall games I’ve played in quite some time. The crux of all this is the control system in Tennis Champs Returns. It’s not necessarily complex, and in fact it makes ingenious use of just a control stick and two virtual buttons to offer basically everything you’d ever need from a tennis game. But it is different, and will require you to rewire your brain a bit. The virtual stick controls your player’s movement and shot direction, and how it accomplishes both at the same time I’ll get to in a second. Then you have two buttons, one for a normal shot and one for a power shot. Both buttons pull triple duty by being able to be pressed and released normally, or pressed and swiped either up or down to pull off the more advanced shots like slices and drops. 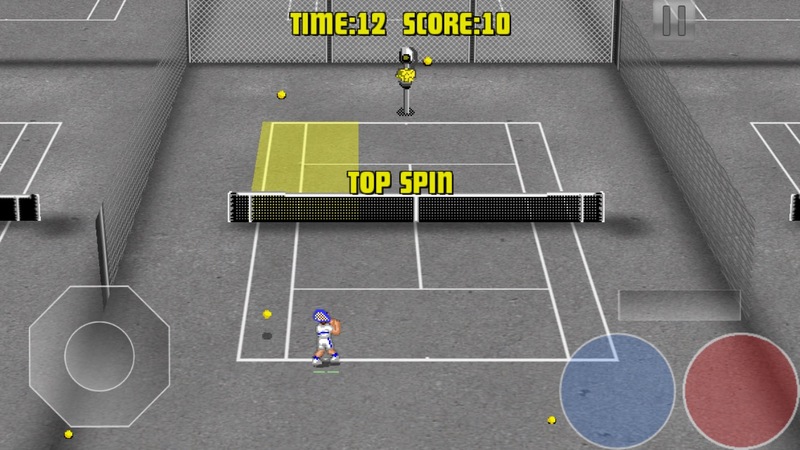 The way you hit the ball in Tennis Champs Returns is where things get really interesting. There’s a meter above the buttons that begins filling from both sides once you press either button and meets in the middle. The goal is to let go right when the two bars meet perfectly in the middle, with letting go too early or too late potentially causing you to miss the mark with your shot. Getting the timing down with the meter is tricky, but once it clicks it makes you feel like a total rock star when you nail a perfect shot, and a total klutz when you blow it. It’s a really fun and smart mechanic. So here’s where things get a little weird. You use the stick to move your player around the court, but when you’re getting ready to return a ball pressing a shot button will cause your player to automatically run towards where the ball is. This allows you to use the stick to determine where on the court you want your return shot to go. This was the hardest thing for me to wrap my head around, and my only advice is to stick with it and practice. It’ll click eventually, and when it does you won’t be able to imagine playing any other way. It’s genius because it allows you to make split-second strategic decisions based on where your opponent is on the court without muddling things up with an extra button or something. However, you have to get used to the fact that sometimes you’re using the stick to move your guy, and sometimes you’re not, but there’s a nice rhythm to it all that feels great once you’ve dialed it in. Occasionally this core control system changes up a bit, too. When you’re close to the net the shot meter isn’t used at all, as there wouldn’t really be time for it. Instead you just tap or tap-and-slide one of the buttons to perform the desired shot and aim with the stick. Also sometimes your opponent will hit a lofty shot towards you and if that’s the case a tiny circle appears on the court where the ball will drop. If you can get to that circle and time your shot just right you can perform a smash, which is just stupidly satisfying. 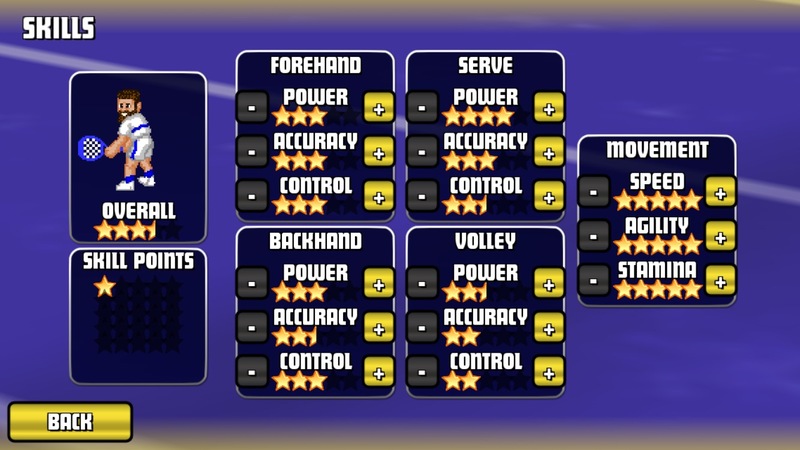 You also perform serves in a neat way by controlling your aim with a combination of the stick and your button press, which ends up feeling like using an Etch-A-Sketch. It’s neat because you have just enough control that you can place a serve pretty much where you want if you focus and have good timing, but it’s chaotic enough that you can’t simply place a serve exactly where you want and cheese a bunch of aces on your opponent. As mentioned there are all sorts of advanced shots you can do which are covered thoroughly in a set of tutorials, and I absolutely recommend playing through one or two at a time and then heading to a Quick Match to practice what you’ve just learned. Then go back and do those tutorials again. Really soak up the info as the text boxes come and go automatically, so they’re easy to miss if you aren’t paying attention. I found I was learning little things even on the third and fourth times playing a tutorial level. Slowly work your way through the tutorials with practices in between, and don’t be scared to go back to them at any time. Even more than a week with Tennis Champs Returns and I still frequently pop into the tutorials for a brush up. There are also training mini-games you can play from the main Career screen. They start out fairly easy and ramp up with each new one that you beat. I find that this is a good litmus test of where my skills are at, and trying and retrying one to get 3 stars is a great way to hammer home the game’s mechanics. Plus it’s just plain fun, and a nice break from regular matches. Eventually you’ll be running all around the court and hitting shots like a ninja with Tennis Champ’s controls. It gets to a point where everything you’re doing happens almost subconsciously, and only after I’ve hung in with an intense rally and finally goaded my opponent out of position so I could smash a ball past him that I can step back and think “OMG that was amazing!" Of course there’s an equal amount of times I make a poor decision and get beat, but it never feels like it’s because I was fumbling with the controls. It’s only ever because I made a bad decision or the AI was just that damn good. And the AI here is bloody fantastic. The various ratings of AI opponents feel spot on, and while it’s easy enough to score on a 1 star character with some pretty basic strategies you also don’t want to take that opponent for granted. They will surprise you. Likewise, higher rated opponents feel sufficiently more challenging but never cheap or impossible to beat. I feel like I’ve said so much but there’s still so much to cover about this game. I guess if you’ve stuck with me so far, I might as well go full Musgrave on this sucker. So the meat of Tennis Champs Returns is in its Career mode. Here you’ll create a player (male only for now, but females are in the works) and work through an event calendar that consists of various tournaments and matches from week to week. You get the choice of up to 3 different events to enter, which is nice as you can choose an easier tournament or a challenging one depending on your mood. There are also Daily Challenges which offer unique tasks each day and reward you for completing them. You can even play previous Daily Challenges you missed if you want, but you’ll only receive a reward for beating the current day’s on that day. The rewards you earn from Career matches and Daily Challenges include skill points which can be distributed to a number of areas to flesh out your characters stats; tons of different types of clothing items and colors so you can totally personalize your character; and coins. Coins can be used to buy pre-match power-ups and are also used to enter Career events if you’re a free player, but I’ll explain that in a minute. Finally, you also earn experience for playing matches which contribute to your character’s overall level, and rewards are doled out for each level up. 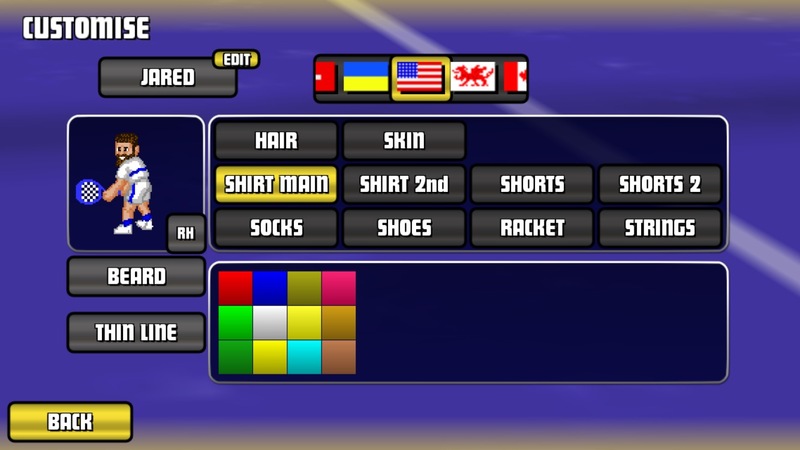 Customizing your character is way more fun than it should be, and offering so many little customization options and items along with the leveling system gives Tennis Champs Returns an almost RPG feel. I’m totally invested in my character, and I love increasing my various skill areas and trying out new customization items as they unlock. Everything in Tennis Champs Returns comes together to make for such a stellar experience, and it’s only the beginning. There’s a lot on deck for updates, including female players and more customization options; a trophy room so you can admire your wins and even go back to re-challenge those opponents you lost to; customizable visual controls and official MFi support (it works now but it’s not fully explained anywhere in-game yet); and more. Uprising Games also has ideas for a rival system and possibly even online play, which would be brilliant. First we’ll have to see how this game does, as this is the side project of a one-man developer (the original coder of the Amiga version, actually, which is pretty neat). If things go well I can see Tennis Champs Returns living a long and happy life. Speaking of the game doing well, let’s talk about its pay model. 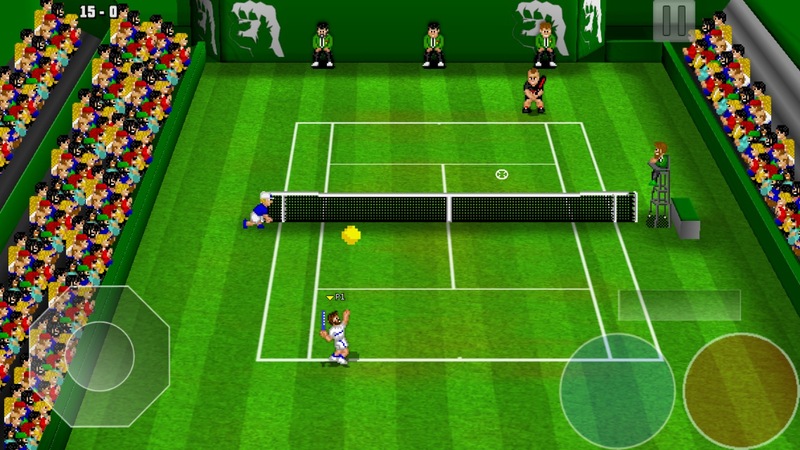 Tennis Champs Returns is free to play, with an optional premium unlock IAP. Free players will see occasional ads, and also will need to spend coins on entering Career events. Conceivably, you could get to a point where you run out of coins and would need to buy an IAP pack of some, but this doesn’t really make sense as at that point you might as well buy the 99¢ VIP package which removes the coin requirements for entering tournaments, removes ads, and doubles the XP you earn in your Career. If you are staunchly opposed to spending even a dollar on this game then I suppose you might get stuck having to grind other modes to earn coins and continue progressing your career, but by that point if you’re enjoying the game and playing it that much you might as well check the couch cushions for a buck to spend on VIP. There’s also a $1.99 starter pack which gives you a nice boost in the early goings of the game and I think is worth the purchase, but is totally nonessential. Those of you who pay close attention may know that I don’t write a ton of reviews around here anymore, but every once in a while a game comes along that I feel like I just have to spill my guts about. Both for my own contemplation but also to help spread the word about iOS games that are truly special and should not be missed, and Tennis Champs Returns is most definitely a special game if there ever was one. I can’t recall the last time I’ve audibly cursed myself over making a stupid move, or audibly praised an AI opponent for playing so well. I mean, here I am, a grown man telling a little virtual tennis player “Wow, nice point!" out loud by myself in my living room. This sort of thing happens all the time with Tennis Champs Returns. If that isn’t an indication of the type of enjoyment this game brings, I’m not sure what is. Tennis Champs Returns is a game filled with tense moments, fiercely competitive opponents, and a real sense of skill and mastery that will have you feeling like you’re growing as a player and as a person the farther you progress. I haven’t felt that a game nailed an overall package so well since Wayward Souls ($6.99), and as weird as the comparison may be this is the Wayward Souls of tennis games. A game built on real skill and finely honed mechanics. Also, it actually “feels" like you’re playing tennis, which is a crucial aspect that many sports games miss. These 2,000+ words are probably way more than are needed to get someone to download and try a free game, but hopefully that’s a testament to the impression Tennis Champs Returns has left on me, and hopefully plenty of people will get the same type of joy out of the experience that I have. Our forums are already filled with folks loving the game, so stop whatever you’re doing and go grab this one, as it’s a truly special experience.